Sang Tan/APGisele Buendchen contemplates currency exchange rates. In November 2007, Gisele Buendchen -- the international supermodel, wife of future Hall of Fame quarterback Tom Brady and, according to Forbes, the 89th most powerful woman in the world -- made a move so out of character that it left many scratching their heads. "I won't get out of bed for U.S. dollars," the headlines screamed, referring to the Brazilian beauty's demand that she be paid in euros instead of dollars for her new contracts with Procter & Gamble (PG) and Dolce & Gabbana. According to Bündchen's sister and manager Patricia, the uncertain outlook for the U.S. dollar caused the supermodel to make the change. Up until that point, Gisele's name had been regularly connected with haute couture, jet-setters and Hollywood -- but finances? Not so much. However, investors should have paid close attention to the future Mrs. Brady's financial maneuvering, because she was providing them with a powerful signal of change –- a contrary indicator. A contrary indicator is any action, proclamation or trend that on the surface would be considered an endorsement that a market or asset is moving in one direction, when in fact, it should be seen as the opposite. It's a warning that a change is coming, especially in a long-established trend. Some of the more common ones involve points when "everyone" -- not just the experts -- has recognized the pattern. That's often a good sign it's just about over. One of the most famous –- though possibly apocryphal -– tales of a contrary indicator involves Joseph Kennedy, father of President John F. Kennedy and a savvy stock market operator. In the run-up to the 1929 crash, stock speculation was running rampant as the general public rushed to buy equities. Kennedy claims that he knew it was time to sell his holdings –- which he did before the crash -- when he received a stock tip from his shoeshine boy. When the guy shining your shoes thinks he has insider knowledge, it's a pretty clear sign that uninformed investing is out of control, and that those rising prices are an unsustainable bubble. What's It All About, Gisele? 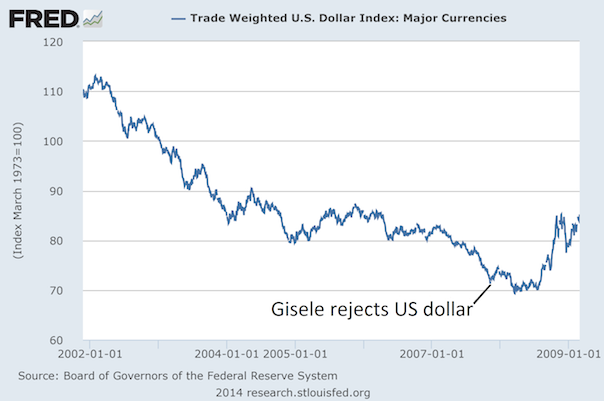 At the time that Gisele decided to play currency speculator, the dollar had spent five years declining against the other major world currencies, losing 37 percent of its value since early 2002. Clearly, she thought it would keep going in that direction. Everyone could see which way the wind was blowing. But her call turned out to be a perfect contrary indicator as the dollar bottomed –- only 3 percent lower –- less than six months later and by November of 2008 was up almost 13 percent. To be fair, Gisele wasn't the only artist who got it wrong. One week after she cast aside the dollar, Jay-Z jumped on the bandwagon when he released the video for his song "Blue Moon" in which he is shown repeatedly flashing a wad of cash consisting solely of 500 euro notes. But contrary indicators aren't always about an external event. Sometimes a major shift in a person's behavior can indicate that change is coming. For example, when the teetotaler suddenly decides to have a drink or the 45-year-old married father of four starts to go to the gym and Googles "hair transplant surgery" on a regular basis, you might want to pay attention. In financial circles this is called the "red Ferrari" syndrome. The name is derived from a clichéd but far-too-common occurrence among hotshot money managers in the '80s and '90s. After beating the market handily on a regular basis, a normally low-key and reclusive hedge fund manager would suddenly show up in the company parking lot with a new red Ferrari -- which was a sure sign that he was doomed to experience terrible returns going forward. The thinking went that the manager's previous gains had been due to his single-mindedness and diligence in analyzing and managing his client's investments. But after repeated successes, he would begin to believe his own hype, and start spending less time on investing and more time playing. Believing that he had some innate and infallible gift for making money, he'd begin to spend his wealth freely, secure in the knowledge that there would always be more where that came from. And what better way to start than with a bright red Ferrari to illustrate how well he is doing? In today's world, the equivalent of the red Ferrari indicator is when a CEO begins spending more time giving TV interviews and attending benefits and galas than on actually running their company. Using the concept of the contrary indicator in your investing –- or in your life –- can be powerful, but it shouldn't be viewed as an exact science. Instead, think of those indicators as potential warning signs of change, which you can then confirm or reject by using additional analysis and data. Subscribe to my newsletter The Lund Loop a free once-weekly curated slice of what I'm writing, reading, and hearing about in finance, tech, music, pop culture, humor and the good life. But not sports or knitting ... ever.